Delineating the relative contributions of B lymphocytes during the course of autoimmune disease has been difficult. Therefore, the effects of depleting all mature B cells using a potent CD20 mAb, or of depleting circulating and marginal zone B cells using a ligand-blocking CD22 mAb, were compared in NZB/W F1 mice, a model for human systemic lupus erythematosus. Single low-dose mAb treatments depleted B cells efficiently in both NZB/W F1 and C57BL/6 mice. Prophylactic B cell depletion by repeated CD20 mAb treatments prolonged survival during pristane-accelerated lupus in NZB/W F1 mice, whereas CD22 mAb had little effect. Despite effective B cell depletion, neither mAb treatment prevented autoantibody generation. In addition, CD20, CD22, and control mAb-treated NZB/W F1 mice developed anti-mouse IgG autoantibodies in contrast to parental NZB and NZW strains, which may have reduced the effectiveness of B cell depletion. Despite this, low-dose CD20 mAb treatment initiated in 12–28-wk-old mice, and administered every 4 wk thereafter, significantly delayed spontaneous disease in NZB/W F1 mice. By contrast, B cell depletion initiated in 4-wk-old mice hastened disease onset, which paralleled depletion of the IL-10–producing regulatory B cell subset called B10 cells. B10 cells were phenotypically similar in NZB/W F1 and C57BL/6 mice, but were expanded significantly in young NZB/W F1 mice. Thus, B cell depletion had significant effects on NZB/W F1 mouse survival that were dependent on the timing of treatment initiation. Therefore, distinct B cell populations can have opposing protective and pathogenic roles during lupus progression. Systemic lupus erythematosus (SLE) is a multiorgan autoimmune disease characterized by autoantibody production and immune complex deposition, with subsequent end-organ damage. In addition to the contributions of T cells, B cells also play essential roles in human SLE development and pathogenesis (1, 2). Spontaneous lupus-like disease also develops in NZB/NZW (NZB/W) F1 hybrid mice, in which immune complex-mediated glomerulonephritis is associated with IgG autoantibody production against nuclear Ags, including dsDNA, RNA, chromatin, and histones (3). Polyclonal B cell activation, expansion of the B-1a and marginal zone B cell subsets (4–9), and high serum IgM and IgG levels (10, 11) are prominent in NZB/W F1 mice, even before disease manifestations. Intrinsic B cell defects are also found in MRL/lpr mice that develop a similar lupus-like disease (12). Therefore, aberrant B cell function is thought to be central to the development and/or progression of lupus-like diseases in mice and humans (1, 2). Although B cells are generally thought to promote lupus and other autoimmune conditions by producing autoantibodies, B cells also have critical functions in regulating autoimmune disease pathogenesis that extend beyond Ab production (13). For example, B cells regulate disease development and pathogenesis by promoting pathogenic CD4+ T cell activation through their APC function and cytokine production (14–17). In support of this, mIgM.MRL/lpr mice that express transgenic membrane IgM, but do not secrete appreciable serum Ig, still develop nephritis and vasculitis in contrast to B cell-deficient MRL/lpr mice that exhibit comparatively less pronounced disease (18, 19). While informative, the use of genetically B cell-deficient mice to study autoimmunity is complicated by their multiple pre-existing immune system alterations (20–25). Furthermore, it is not possible to examine the role of B cells at different time points during disease in congenitally B cell-deficient mice. This is important to assess because B cells have opposing roles during the initiation and progressive stages of inflammation, experimental autoimmune encephalomyelitis (EAE), and potentially other autoimmune diseases (26–28). B cell depletion using a therapeutic CD20 mAb has shown clinical efficacy in some patients with SLE, although the rituximab anti-human CD20 mAb has not had a significant therapeutic benefit in larger phase II/III and phase III randomized, placebo-controlled clinical trials for lupus nephritis and moderate to severe SLE without active nephritis (29–33). In part, this may be explained by the recent report that autoimmune B cells are inherently resistant to B cell depletion in MRL/lpr mice expressing a human CD20 transgene (34). Despite resistance to therapy, high-dose mouse anti-human CD20 mAb treatments reduced clinical disease and anti-nuclear Ab (ANA) levels, although it is unknown whether B cell depletion or high doses of exogenous IgG ameliorated disease symptoms, because disease was not assessed in control IgG-treated mice. In contrast, CD22 represents another B cell-specific target for human and mouse B cell depletion (35, 36). A humanized CD22 mAb, epratuzumab, reduces disease activity in some patients with SLE and other autoimmune diseases (32). Thus, B cells may be clinically important during SLE and lupus-like diseases, but the therapeutic effectiveness of B cell depletion remains unresolved. B cell depleting mouse anti-mouse CD20 and CD22 mAbs have provided mechanistic insights into B cell functions in autoimmune mouse models of tight skin fibrosis, EAE, type 1 diabetes, collagen- and proteoglycan-induced arthritis, and thyroiditis (27, 36–44). The MB20-11 anti-mouse CD20 mAb depletes the vast majority of ma-ture blood, peripheral lymph node, and spleen B cells in C57BL/6 mice through Ab-dependent cellular cytotoxicity (ADCC) (37, 45). By contrast, CD22 mAbs selectively deplete blood, mature recirculating bone marrow, and marginal zone B cells in C57BL/6 mice (36). CD22 mAbs, such as MB22-11, deplete these B cell subsets by interfering with CD22 sialic acid ligand binding, an important survival factor for peripheral B cells (36, 46). Because CD20 and CD22 mAbs deplete different B cell populations, and different CD20 mAbs have different B cell depletion efficiencies in vivo (37, 47), we examined B cell depletion in C57BL/6 and NZB/W F1 mice using low doses of well-characterized CD20 and CD22 mAbs, and we determined whether B cell depletion affects lupus-like disease in NZB/W F1 mice (36, 37, 45). Remarkably, B cells exerted pathogenic and protective functions at distinct time points during the course of lupus initiation and progression, which may correlate with the expansion of a recently defined regulatory B cell subset in mice (26–28, 48). C57BL/6 and female NZB/W F1 mice for pristane-accelerated lupus and the analysis of short-term B cell depletion were from The Jackson Laboratory (Bar Harbor, ME). For accelerated lupus, 8-wk-old NZB/W F1 mice were injected i.p. with 200 μl pristane (Sigma-Aldrich, St. Louis, MO). NZB and NZW mice were purchased from Japan SLC (Shizuoka, Japan) for conventional lupus experiments, with female NZB/W F1 mice generated by mating female NZB and male NZW mice. All mice were housed under specific pathogen-free conditions. All procedures were approved by Duke University’s Animal Care and Use Committee and the Animal Committee of The International Medical Center of Japan. Mouse anti-mouse CD20 mAb, MB20-11, and mouse anti-mouse CD22 mAb, MB22-11, were as described (36–38). MB20-11 and MB22-11 mAbs were purified using protein A Hi-Trap columns according to the manufacturer’s instructions (Amersham Pharmacia, Piscataway, NJ). MB20-11 and MB22-11 are IgG2c mAbs because of their C57BL/6 origins (49, 50). Nonetheless, IgG2a-specific Ab reagents (Southern Biotechnology Associates, Birmingham, AL) reacted with IgG2c mAbs. Other reagents included: FITC-, PE-, and PE-cy5–conjugated anti-mouse B220 (CD45R, RA3-6B2), CD5 (53-7.3), CD19 (1D3), CD21/35 (7G6), CD21 (B3B4), CD24 (M1/69), CD43 (S7), and CD93 (AA4.1) mAbs (BD Biosciences, San Jose, CA); CD11b (M170) and CD1d (1B1; eBioscience, San Diego, CA) mAbs; and polyclonal goat anti-IgM and -IgD Abs (Southern Biotechnology Associates). IgG1, IgG2a, and IgG2c mAb isotype standards were either generated in-house or purchased from Southern Biotechnology Associates. Sterile MB20-11, MB22-11, or IgG2a isotype control (generated in house) mAbs (10–100 μg in 100–200 μl PBS) were given to NZB/W F1 or C57BL/6 mice. For pristane-accelerated lupus, each mAb (100 μg) was given i.p. 2 wk after pristane treatment, with repeated mAb treatment every 10 d for a total of 11 doses. For the conventional lupus model, mAb (10 μg i.v.) was given between 4 and 32 wk old, with treatment repeated every subsequent 4 wks. After mAb treatment, blood leukocyte numbers were quantified by hemocytometer following red cell lysis, with cell frequencies determined by immunofluorescence staining with flow cytometric analysis. Single-cell leukocyte suspensions from spleen, bone marrow (bilateral femur), peritoneal lavage, and peripheral lymph nodes (bilateral inguinal) were isolated, with erythrocytes lysed in Tris-buffered 100 mM ammonium chloride solution. Leukocytes were then stained at 4°C using predetermined optimal concentrations of each Ab for 30 min. For whole blood, erythrocytes were lysed after staining using FACS Lysing Solution (BD Biosciences, San Jose, CA). Ab binding was analyzed on a FACScan flow cytometer (BD Biosciences) by gating on cells with the forward and side light scatter properties of lymphocytes. Nonreactive, isotype-matched Abs (Caltag Laboratories [Burlingame, CA], eBioscience, and BD Biosciences) were used as controls for background staining. Total serum IgM, IgG, IgG1, IgG2a, IgG2b, and IgG3 concentrations were determined as described (51). Ninety-six–well ELISA plates were coated with 2 μg/ml goat anti-mouse Ig (H+L) Abs (Southern Biotechnology Associates) in 0.1 M borate buffered saline and incubated overnight at 4°C. Plates were blocked with TBS containing 1% BSA and 2% gelatin, washed with TBS containing 0.1% Tween, and incubated with serum (diluted 1:10,000 for IgM; 1:50,000 for IgG; 1:7500 for IgG1; 1:20,000 for IgG2a; 1:5000 for IgG2b; and 1:2500 for IgG3 detection) in TBS containing 1% BSA from NZB/W F1 mice for 1.5 h at room temperature. Washed plates were incubated for 1 h at room temperature with AP-conjugated goat anti-mouse IgM, IgG, IgG1, IgG2a, IgG2b, and IgG3 Abs (Southern Biotechnology Associates), washed, and developed using 1 mg/ml pNPP (Sigma-Aldrich) in 0.1 M diethanolamine. Ab concentrations were determined from standard curves generated using isotype-specific standards (Southern Biotechnology Associates). Anti-dsDNA and anti-histone serum IgM, IgG, IgG1, IgG2a, IgG2b, and IgG3 Ab levels were assessed in a similar manner using sera diluted at 1:500, except that the plates were precoated with 2 μg/ml calf thymus DNA (Sigma-Aldrich) in 1× SSC or 5 μg/ml type II-AS histone (Sigma-Aldrich) in 0.1 M borate-buffered saline. Serum IgG reactivity with mAbs used in pristane-accelerated lupus was determined using 96-well ELISA plates coated overnight at 4°C with 5 μg/ml MB20-11, MB22-11, treatment control mAb, or mouse IgG2a or IgG1 in 0.1 M borate-buffered saline. The plates were blocked, incubated with serum (diluted 1:500 in TBS containing 1% BSA) for 1.5 h at room temperature, and washed. Plates coated with IgG2a or IgG2c mAbs, or IgG2a were incubated with a mixture of AP-conjugated anti-mouse IgG1, IgG2b, and IgG3 Abs (Southern Biotechnology Associates) for 1 h. Plates coated with IgG1 were incubated with a mixture of AP-conjugated anti-mouse IgG2a, IgG2b, and IgG3 Abs. MB20-11, IgG2a, and IgG2c control mAb reactivity in conventional lupus was also assessed by incubating serum (diluted 1:5 in PBS) with plates coated with goat anti-mouse IgG (H+L; 4 μg/ml; Invitrogen, Carlsbad, CA). The plates were washed; incubated with biotinylated MB20-11 mAb, biotinylated IgG2a, or biotinylated IgG2c (clone 6.3; Southern Biotechnology Associates) mAb (4 μg/ml; biotinylated using EZ-Link sulfo–NHS-Biotin; Thermo Scientific, Rockford, IL) in PBS containing 10% FBS for 1 h at room temperature; washed; and incubated with HRP-conjugated streptavidin (Fisher Scientific, Pittsburgh, PA) for 1 h at room temperature. All plates were washed and developed with TMB substrate (Thermo Scientific) and stopped with 1 N H2SO4 before 450 nm wavelength light absorbance values exceeded 2.0. Mean optical densities from three control non–Ab-coated blank wells (OD < 0.05) were subtracted from each determination. Serum ANA reactivity with human HEp-2 cells (HEp-2 Cell Substrate Slide; MBL, Japan) was examined by incubating sera (diluted 1:100 in PBS) with fixed HEp-2–cell-coated slides for 30 min at room temperature. The slides were then washed three times with PBS, with ANA detected using FITC-conjugated goat anti-mouse IgG (H+L) Ab at optimal concentrations for 30 min at room temperature. The slides were evaluated by fluorescence microscopy at ×400 magnification. ANA staining exhibited a homogenous to speckled nuclear pattern, with fluorescence staining above background (secondary Ab alone) levels considered positive. Proteinurea was assessed using Nephrosticks L (Bayer Medical, Tokyo, Japan). NZB/W F1 mice demonstrated glomerulonephritis and immune complex deposition on glomerular basement membranes when their proteinurea values exceeded 3 mg/ml (data not shown). Therefore, mice were considered positive for proteinurea when readings were >3 mg/ml. Intracellular IL-10 production by B cells was examined by flow cytometry as described (26). Briefly, isolated leukocytes or purified cells were resuspended (2 × 106 cells/ml) in complete medium (RPMI 1640 media containing 10% FCS, 200 μg/ml penicillin, 200 U/ml streptomycin, 4 mM l-glutamine, and 5 × 10−5 M 2-ME [Life Technologies, Carlsbad, CA]) with LPS (10 μg/ml, Escherichia coli serotype O111: B4; Sigma-Aldrich), PMA (50 ng/ml; Sigma-Aldrich), ionomycin (500 ng/ml; Sigma-Aldrich), and monensin (2 μM; eBioscience) for 5 h at 37°C. After cell-surface staining, the cells were washed, fixed, and permeabilized using a Cytofix/Cytoperm Kit (BD Pharmingen, San Diego, CA) according to the manufacturer’s instructions. Cells were then stained with PE-conjugated mouse anti–IL-10 mAb (JES5-16E3; eBioscience). A PE-conjugated rat IgG2b isotype control mAb was used as a negative control to establish background staining levels. Dead cells were excluded from the analysis based on their forward- and side-light scatter properties and the use of LIVE/DEAD Fixable Dead Cell Stain Kits (Invitrogen). B10 progenitor (B10pro) plus B10 cell numbers were determined as described (48). Cells were cultured for 48 h with agonistic CD40 mAb (1 μg/ml, clone HM40-3; BD Biosciences), with LPS, PMA, ionomycin, and monensin added during the final 5 h of culture. Leukocytes from IL-10−/− mice served as negative controls to verify reagent specificity and to establish background IL-10 staining levels. ANA, proteinurea, and survival data were analyzed using Kaplan-Meier curves and the Log rank test. Unless indicated otherwise, data are shown as mean values ± SEM. Comparisons between groups were made using Steel-Dwass analysis or Student t test; p < 0.05 was considered statistically significant. The efficacy of CD20 and CD22 mAb-induced B cell depletion was first assessed in 8- to 10 wk-old female NZB/W F1 mice. CD20 mAb (100 μg) depleted comparable numbers of mature B cells in NZB/W F1 and C57BL/6 mice 7 d after treatment (Fig. 1A). In NZB/W F1 and C57BL/6 mice, CD20 mAbs depleted mature B cells from the bone marrow (96 versus 94%), blood (97 versus 99%), spleen (90 versus 84%), spleen marginal zone (99 versus 83%), and lymph nodes (86 versus 84%). Thus, significant intrinsic differences in CD20 mAb-induced B cell depletion were not found between NZB/W F1 and C57BL/6 mice. 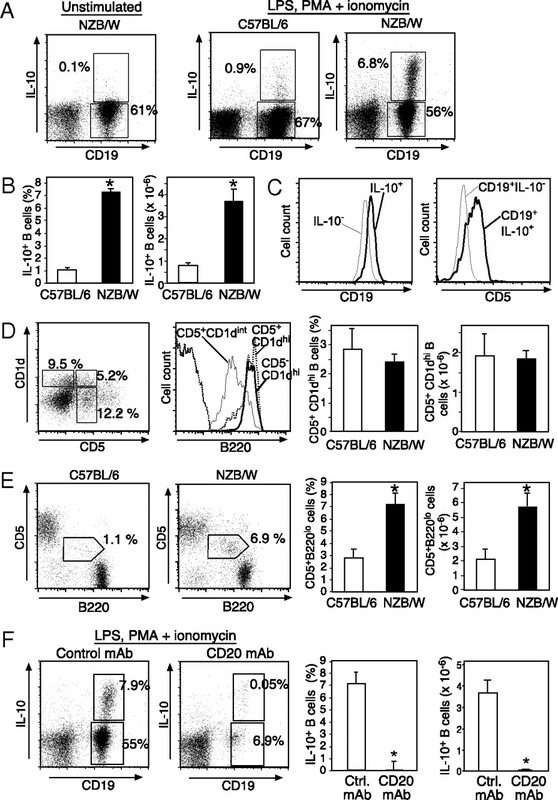 B cell depletion by CD20 and CD22 mAbs in NZB/W F1 and C57BL/6 mice. CD20 (A), CD22 (B), or IgG2a control mAb (100 μg) was given i.p. to 8–10-wk-old mice with B cell numbers quantified on day 7. B220+ blood, B220+ spleen, B220+ peripheral lymph node, mature recirculating bone marrow (IgD+B220hi), marginal zone (B220+CD21hiCD1dhi), and peritoneal B1 (B220+IgM+CD11b+) and B2 (B220+IgM+CD11b−) cell numbers were determined by immunofluorescence staining with flow cytometric analysis. Representative dot plots are shown for mAb-treated NZB/W F1 mice with gated B cell percentages indicated. Significant differences between mean (± SEM) values for control mAb-treated (open bars) and CD20 or CD22 mAb-treated (filled bars) mice are indicated. *p < 0.05. Data are representative of results obtained from at least three mice per mAb treatment. Mouse anti-mouse CD22 mAb rapidly depletes mature recirculating bone marrow, blood, and marginal zone B cells through ADCC-independent mechanisms, but only ∼20% of mature CD22+ follicular B cells in C57BL/6 mice (36). The MB22-11 mouse anti-mouse CD22 mAb (100 μg) depleted mature recirculating bone marrow (49 versus 58%), blood (75 versus 84%), and marginal zone (77 versus 82%) B cells to the same extent in NZB/W F1 and C57BL/6 mice (Fig. 1B). Although the CD20 and CD22 mAbs deplete different mature B cell subsets through different mechanisms, there do not appear to be intrinsic differences in CD20 or CD22 mAb-induced B cell depletion between NZB/W F1 and C57BL/6 mice. NZB/W F1 mice normally develop ANA by 16–24 wk old, nephritis from 28–36 wk, and die at ∼36 wk. However, pristane treatment of NZB/W F1 mice accelerates the course of lupus-like disease (52, 53). Therefore, the role of B cells in pristane-accelerated mortality in 8-wk-old female NZB/W F1 mice was evaluated following low-dose pristane administration with subsequent CD20, CD22, or control mAb (100 μg) treatments every 10 d for 16 wk. From the initiation of mAb treatment up until 34 wk old, survival was improved in CD20 mAb-treated mice compared with control mAb-treated mice (29–34 wk; p < 0.05, Log rank test; Fig. 2A). Median (50%) survival was also increased 23%, from 26 wk in control mAb-treated mice to 32 wk in CD20 mAb-treated mice. However, CD20 mAb-treated mice began to succumb to disease more rapidly after this point such that differences in overall survival curve comparisons at 52 wk were not found to be significant (p = 0.09; Fig. 2A). In contrast to the improved survival during early disease with total mature B cell depletion, survival following CD22 mAb treatment was more comparable to IgG2a control throughout the course of disease (Fig. 2B). Thus, the depletion of most mature B cells improved survival in pristane-accelerated lupus. Effects of B cell depletion by CD20 and CD22 mAbs on disease in pristane-accelerated lupus. Eight-week-old female NZB/W F1 mice were given 200 μl pristane i.p. Two weeks later, mice were given either CD20 (A), CD22 (B), or control mAb (100 μg) i.p., with the same mAb dose administered every 10 d over a 16-wk period (11 doses total; arrowheads). Kaplan-Meier survival curves are shown with statistical differences assessed at 52 wk old using the Log-rank test. C–G, Effects of B cell depletion on serum Ig, autoantibody, and anti-treatment Ab levels in pristane-accelerated lupus. Total serum (C), anti-dsDNA (D), and anti-histone (E) Ab levels in 8–25-wk-old mice treated with CD20 (n = 10), CD22 (n = 18), or control (n = 18) mAbs. F–G, Resistance to B cell depletion in pristane-accelerated lupus in female NZB/W F1. F, Representative plots show blood B220+ B cell depletion 7 d following the fifth dose of CD20, CD22, or control mAb. Bar graphs show mean (± SEM) blood B cell depletion in each mAb treatment group (n ≥ 10). G, Reactivity of serum IgG obtained from mice treated with MB20-11 (CD20 mAb), MB22-11 (CD22 mAb), treatment control mAb, or irrelevant IgG2a and IgG1 mAbs as determined by ELISA. C–G, Significant differences between mean (± SEM) OD values for control mAb and CD20 or CD22 mAb-treated mice are indicated; *p < 0.05. Significant differences between mean (± SEM) OD values for 8- and 16-wk-old mice are indicated; †p < 0.05, (n ≥ 10 mice per group). Prophylactic B cell depletion using CD20 mAb significantly reduces isotype switching and IgG immune responses after Ag challenge, and autoantibody generation in autoimmune prone mice, whereas therapeutic B cell depletion after autoimmune disease initiation has no effect (39, 40, 54). Similarly, total serum IgM was not dramatically altered by CD20 or CD22 mAb-induced B cell depletion from low-dose pristane-treated NZB/W F1 mice between 8 and 25 wk old (Fig. 2C). Unexpectedly, total serum IgG levels increased significantly with age (8 versus 16 wk; p < 0.05) despite CD20 or CD22 mAb treatment when compared with control mAb-treated NZB/W F1 littermates. Anti-dsDNA and anti-histone IgM and IgG autoantibodies also increased significantly between 8 and 16 wk old in all treatment groups (p < 0.05; Fig. 2D, 2E). Thus, mature B cell and B cell subset depletion did not dramatically affect serum Ig levels or autoantibody production in low-dose pristane-treated NZB/W F1 mice. Because B cell depletion delayed mortality, but did not cure disease, in pristane-accelerated lupus (Fig. 2), the efficiency of B cell depletion during disease was assessed. First, the ability of CD20 and CD22 mAbs to deplete blood B cells was examined in pristane-treated NZB/W F1 mice given CD20, CD22, or control mAbs during 16 wk of treatment. The level of B cell depletion observed at 16 wk for both CD20 and CD22 mAb-treated mice was decreased compared with depletion in 8-wk-old mice that did not receive pristane (Figs. 1, 2F). Whereas CD20 and CD22 mAbs reduced blood B cell numbers by 75–97% in 8-wk-old mice (Fig. 1), blood B cell numbers were reduced only by 28–43% in 16-wk-old NZB/W F1 mice (Fig 2F). NZB/W F1 mice, like other lupus-prone mice, can generate serum IgM and IgG rheumatoid factors as disease progresses (55, 56). Therefore, circulating anti-IgG Ab levels were quantified before and during mAb treatment. All NZB/W F1 mice had significantly higher levels of IgG Abs that were reactive with IgG2c, IgG2a, and IgG1 Abs at 16 wk old, compared with levels at 8 wk old (Fig. 2G). Sixteen-week-old mice given control, CD20, or CD22 mAb four times had ≥2.5-fold higher levels of serum IgG (IgG2a Abs not measured in the assay) reactive with the mAb that they were given when compared with 8-wk-old mice. Sixteen-week-old mice given CD20 or CD22 mAb had even higher levels of serum IgG (IgG2a Abs not measured in the assay) reactive with IgG2c (MB20-11 and MB22-11) and IgG2a (control and unrelated mAb) compared with 16-wk-old mice that received control mAb. There were no significant differences among age-matched treatment groups in IgG1-reactive serum IgG levels (IgG1 Abs not measured in the assay). Thus, B cell depletion by CD20 or CD22 mAb treatment did not abrogate the generation of anti-IgG levels in NZB/W F1 mice, which may have contributed to the diminished effectiveness of B cell depletion over time. Moreover, NZB/W F1 mice were unique in that CD20 mAb treatment did not prevent the development of isotype-switched autoantibodies (i.e., anti-DNA and anti-histone IgG), whereas IgG autoantibodies do not increase in other strains of autoimmune mice after CD20 mAb treatment (39, 40, 42, 54). The effects of B cell depletion using lower and less frequent mAb doses in NZB/W F1 mice without pristane pretreatment was next assessed. Mice were given a 10-fold lower mAb treatment dose at 4-wk intervals. One 10-μg dose of CD20 mAb depleted >95% of blood B cells for ∼4 wk in 8-wk-old NZB/W F1 mice (Fig. 3A) as published for C57BL/6 mice (37, 45). However, when 8-wk-old NZB/W F1 mice were given CD20 mAb every 4 wk, five times, circulating B cells were depleted for <1 wk after the last treatment in these 28-wk-old mice. When mice were repetitively given a higher dosing regimen of CD20 mAb (100 μg), the period of B cell depletion following the fifth mAb treatment was equivalent to that observed in mice given 10 μg of mAb repetitively (Fig. 3B). Circulating B cells from depletion-resistant NZB/W F1 mice given CD20 mAb five times every 4 wk expressed normal levels of CD20 as assessed by CD20 mAb staining in vitro (Fig. 3C). Rather, CD20 mAb was cleared rapidly in vivo because circulating B cells from depletion-resistant NZB/W F1 mice did not have residual CD20 mAb bound to their cell surface, as detectable by anti-mouse IgG2a mAb staining (Fig. 3C). Furthermore, serum from depletion-resistant mice contained significantly less circulating CD20 mAb 7 d after treatment than from mice that had been treated with only CD20 mAb once, as determined using serum from mAb-treated mice to stain normal B cells (data not shown). In contrast to NZB/W F1 mice, no difference was observed in B cell clearance in parental NZB, parental NZW, or C57BL/6 mice given CD20 mAb repeatedly in comparison with mice treated once with mAb (Fig. 3D). Therefore, resistance to mAb-induced B cell depletion was unique to NZB/W F1 mice, developed independent of pristane treatment, and was not mAb dose dependent or due to reduced CD20 expression. NZB/W F1 mice generate anti-IgG Abs and exhibit reduced clearance after multiple treatments with B cell-depleting mAbs in conventional lupus. A–C, Generation of anti-IgG Abs in conventional NZB/W F1 lupus. A, Blood B cell depletion in 8-wk-old female NZB/W F1 mice that were given one 10-μg dose of CD20 or control mAb i.p. or five mAb treatments at 4-wk intervals. B220+ blood B cell numbers were analyzed immediately before and after the final CD20 mAb dose at days 1 and 3 and then weekly thereafter. Significant differences in B cell clearance between mice receiving one and five doses of CD20 mAb are indicated. *p < 0.05; **p < 0.01; n = 25 mice per group. B, Blood B cell depletion in NZB/W F1 mice given CD20 mAb (either 10 or 100 μg) every 4 wk, five times (n = 5 mice per group). Blood B cell numbers were determined after the last dose of CD20 mAb as in A. C, CD20 expression on B cells from NZB/W F1 mice after five doses of CD20 mAb. Blood was harvested from CD20 or control mAb-treated mice 7 d after the fifth mAb treatment and stained with PE-conjugated B220 mAb and CD20 mAb, followed by FITC-conjugated anti-mouse IgG2a Ab. Blood samples were also stained separately with FITC-conjugated anti-mouse IgG2a Ab alone to detect residual surface CD20 mAb that had been bound in vivo. D, Blood B cell depletion in C57BL/6, NZB, and NZW mice given one or five doses of CD20 mAb. Eight-week-old mice were given 10 μg CD20 mAb either one time or five times at 4-wk intervals, with depletion assessed as in A. E, NZB/W F1 mice given CD20 or control Ab five times produce IgG Abs reactive with both IgG2a and IgG2c Abs. NZB/W F1 mice were given CD20 or control mAb (10 μg) five times as in A, with serum IgG reactivity with MB20-11 mAb (IgG2c), control treatment mAb (IgG2a), or an irrelevant IgG2c mAb (clone 6.3) measured by ELISA. Mean results (horizontal lines) are significantly different between groups; p < 0.0001. F, Only NZB/W F1 mice produce IgG Abs following CD20 mAb (10 μg) treatment five times as in A. Reactivity of C57BL/6, NZB, NZW, and NZB/W F1 mouse serum with MB20-11 mAb was measured by ELISA. Mean results (horizontal lines) are significantly different between groups as indicated; **p < 0.0001. To determine whether resistance to mAb-induced B cell depletion was associated with the production of anti-IgG Abs, NZB/W F1 mice were treated with 10-μg doses of control or CD20 mAb at 4-wk intervals five times. Subsequently, serum IgG reactive with mouse IgG2a treatment control mAb, CD20 mAb (IgG2c), or irrelevant IgG2c mAb (clone 6.3) was present in the 28-wk-old NZB/W F1 mice, although the anti-IgG2a/c autoantibody levels were significantly higher in depletion-resistant CD20 mAb-treated mice (Fig. 3E). Importantly, following multiple treatments, autoimmune-prone NZB/W F1 mice had significantly higher levels of anti–MB20-11 Abs than either parental NZB and NZW strains or C57BL/6 mice (Fig. 3F). Thus, anti-IgG2a/c Abs are generated in both control and CD20 mAb-treated NZB/W F1 mice, but not NZB, NZW, or C57BL/6 mice, with higher levels observed in depletion-resistant NZB/W F1 mice that had received CD20 mAb. Because total mature B cell depletion improved survival in pristane-accelerated lupus, the efficacy of B cell depletion during conventional (nonaccelerated) lupus development was assessed. NZB/W F1 mice were given CD20 mAb (10 μg) starting at different time points, with repeated treatment every subsequent 4 wk. Unexpectedly, survival was significantly decreased when B cells were depleted beginning at 4 wk old, in comparison with control mAb treated littermates (Fig. 4A). By contrast, survival was significantly enhanced when B cells were first depleted between 12 and 28 wk old. CD20 mAb treatment initiated at 32 wk had no effect on survival. The development of proteinuria was also accelerated when treatment was initiated at 4 wk old, whereas proteinuria was significantly delayed when CD20 mAb was first given at 16 wk old (Fig. 4B). CD20 mAb treatment did not significantly alter the frequency of ANA development when compared with control mAb-treated littermates (Fig. 4C). Differences in disease parameters among untreated NZB/W F1 mice in comparison with littermates that had received control IgG2a mAb were not observed (data not shown). Furthermore, differences in disease parameters among NZB/W F1 mice that had received control IgG2a mAb beginning at 4 versus 32 wk old were not observed (Fig. 4). Therefore, B cell depletion had remarkable yet opposing effects on disease course in NZB/W F1 mice, with early treatment (begun at 4 wk) exacerbating disease and later treatment (begun at 12–28 wk) improving disease. Therapeutic B cell depletion by CD20 mAb either accelerates or improves conventional NZB/W F1 lupus depending on the timing of treatment. CD20 or control mAb (10 μg) were first given i.v. from 4–32 wk old as indicated and repeated every 4 wk with survival (A), proteinuria (B), and (C) ANA production evaluated at least weekly. All data were obtained from ≥15 mice in each treatment group with significant differences indicated. A, Kaplan-Meier survival curves are shown with statistical differences assessed using the Log-rank test. *p < 0.05; **p < 0.01. As in NZB/W F1 mice, early B cell depletion by CD20 mAb promotes inflammation (26) and exacerbates EAE (27). This condition results from the depletion of B10 cells, a unique IL-10–producing regulatory B cell subset found within the spleen CD5+CD1dhi subpopulation (26). Sixteen-week-old NZB/W F1 mice have significantly increased B10 cell numbers in comparison with C57BL/6 mice (48). IL-10–producing B cell frequencies and numbers were also increased >4-fold in 10-wk-old NZB/W F1 mice when compared with C57BL/6 mice (Fig. 5A, 5B). 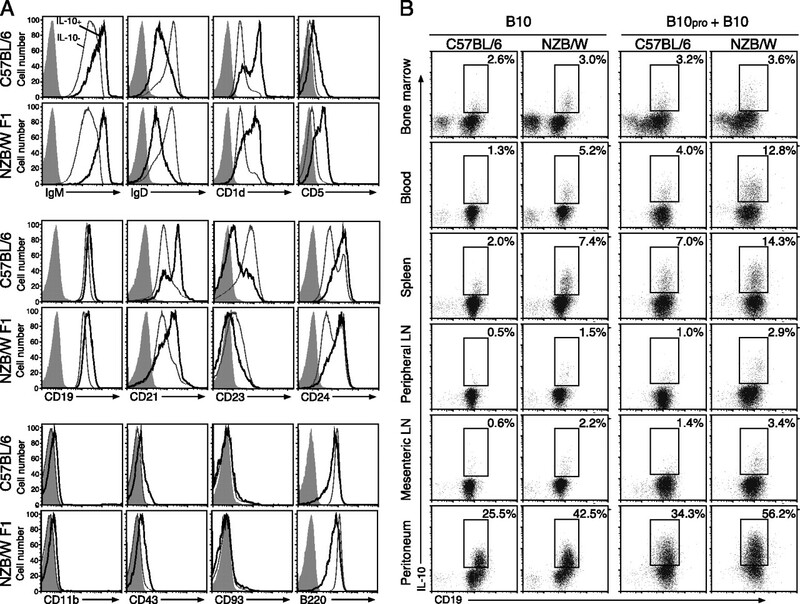 IL-10–producing spleen B cells in NZB/W F1 mice expressed CD5 and higher levels of CD19 in comparison with other B cells (Fig. 5C) as reported for B10 cells in C57BL/6 mice (26). However, NZB/W F1 mice exhibited two splenic CD5+ B cell populations that could be differentiated by their CD1d and B220 expression densities (Fig. 5D). The CD1dhiCD5+ B cell subset expressed high density B220, comparable to that expressed by CD1dhiCD5− B cells. In contrast, the remaining CD5+ B cells expressed intermediate CD1d levels (CD5+CD1dint) and low-density B220, characteristics of B-1a cells. The frequencies and numbers CD1dhiCD5+B220+ cell were not expanded in 10-wk-old NZB/W F1 mice relative to C57BL/6 mice (Fig. 5D), although this subset increases significantly by 16 wk old (48). However, marginal zone (CD21hiCD1dhi) B cell and CD5+B220lo B-1a cell frequencies and numbers were increased in 10-wk-old NZB/W F1 mice relative to age-matched C57BL/6 mice (Figs. 1, 5E) (4–9). Thus, in addition to MZ and B-1a B cells, the IL-10 competent B10 cell subset was significantly expanded in NZB/W F1 mice prior to disease onset. The expanded B10 cell subset in NZB/W F1 mice is depleted by CD20 mAb. A, Representative analysis of IL-10–producing spleen B cell frequencies in NZB/W F1 and C57BL/6 mice. Splenocytes were cultured with LPS, PMA, ionomycin, and monensin for 5 h; stained for cell-surface CD19, CD1d, and CD5; and permeabilized before staining for intracellular IL- 10, with subsequent multicolor flow cytometry analysis. B, Mean (± SEM) spleen cytoplasmic IL-10+ B (CD19+) cell frequencies and numbers in 10-wk-old NZB/W F1 (control mAb-treated) and C57BL/6 mice (n ≥ 3). C, Relative cell surface CD19 and CD5 expression levels by cytoplasmic IL-10+ and IL-10− spleen B cells from NZB/W F1 mice as assessed in (A). D, Representative B220 expression by CD1dhiCD5+, CD1dhiCD5−, and CD1dintCD5+ spleen B220+ B cell subsets in 10-wk-old NZB/W F1 mice. Bar graphs indicate mean (± SEM) frequencies and numbers of CD1dhiCD5+ spleen B cells in NZB/W F1 and C57BL/6 mice. E, Representative frequencies of spleen CD5+B220lo B cells in 10-wk-old NZB/W F1 and C57BL/6 mice. Bar graphs indicate mean (± SEM) frequencies and numbers of CD5+B220lo B cells. F, Depletion of IL-10–producing spleen B cells in NZB/W F1 mice by CD20 mAb. CD20 or control mAbs (100 μg) were given i.p. with IL-10–producing B cells quantified 7 d later as in A. Bar graphs indicate mean (± SEM) frequencies and numbers of IL-10–producing CD19+ cells. A–F, All data represent results obtained from at least three mice (age 10 wk) per group, with significant differences between mean (± SEM) values indicated. *p < 0.05. As in C57BL/6 mice, CD20 mAb was able to deplete IL-10–producing B cells in NZB/W F1 mice. Seven days following CD20 or control mAb treatments, mouse splenocytes were cultured with LPS, PMA, ionomycin, and monensin, and assessed for cytoplasmic IL-10 production. Remarkably, CD20 mAb treatment reduced both the frequency and number of IL-10–producing B cells in NZB/W F1 mice by 99% (Fig. 5F). Thus, CD20 mAb treatment efficiently depletes both regulatory B10 cells and mature B cells in NZB/W F1 mice. Phenotypically unique spleen B cells that are competent to express cytoplasmic IL-10 following 5 h stimulation with LPS, PMA, and ionomycin are predominantly found within the CD1dhiCD5+ CD19hi subset in wild type C57BL/6 mice (26, 27, 48). We have previously shown that 5 h of LPS, PMA, and ionomycin stimulation does not significantly influence the cell surface phenotype of spleen B cells (26). Therefore, the phenotypes of IL-10+CD19+ B10 cells were characterized in 8-wk-old NZB/W F1 mice in comparison with C57BL/6 mice. IL-10+ B cells were predominantly IgMhi, IgDlo, CD1dhi, CD5hi, CD19hi, CD21int/hi, CD23lo, CD24hi, CD11b+/−, CD43+/−, and CD93− (AA4.1) in both NZB/W F1 and C57BL/6 mice (Fig. 6A). Therefore, spleen B10 cells in NZB/W F1 mice share overlapping phenotypic markers with the B-1a, MZ, and T2-MZ precursor B cell subsets, but are nonetheless phenotypically distinct as observed in C57BL/6 mice (26, 27, 48). B10 cell phenotype, development, and distribution in 8-wk-old NZB/W F1 and C57BL/6 mice. A, IL-10–producing B cells were predominantly found within the CD1dhiCD5+ B cell subset in NZB/W F1 and C57BL/6 mice. Splenocytes were cultured with LPS, PMA, ionomycin, and monensin for 5 h, and then stained for cell surface molecules before permeabilization and cytoplasmic IL-10 staining. Cell surface staining is shown for IL-10+ (heavy lines) and IL-10− (thin lines) CD19+ cells. Gray histograms represent isotype-matched control mAb staining. Results are representative of those obtained with B cells from at least three mice as determined by flow cytometric analysis. B, B10 and B10pro cell distributions. To identify B10 cells, B220+ B cells were isolated from tissues and blood, with in vitro stimulation, staining, and analysis as outlined in A. To identify B10pro cells, the B cells were cultured with agonistic CD40 mAb for 48 h with LPS, PMA, ionomycin, and monensin added during the last 5 h of each culture. The cultured cells were isolated, stained with CD19 mAb, permeabilized, and stained using IL-10 mAb with flow cytometric analysis as in A. Values within representative histograms indicate the percentage of IL-10–producing cells among CD19+ B cells within the gates shown. Results are representative of those obtained from at least three 3 mice as determined by flow cytometric analysis. B10 cell development and numbers in 8-wk-old NZB/W F1 and C57BL/6 mice were also compared. B10 cells were identified by their capacity to express cytoplasmic IL-10 after 5 h of LPS, PMA, and ionomycin stimulation (26, 27). Previous studies have also identified B10pro cells that acquire the capacity to express cytoplasmic IL-10 following 48 h of culture with either CD40 mAb or LPS in vitro, with LPS, PMA, and ionomycin stimulation during the final 5 h of culture (48). NZB/W F1 and C57BL/6 mice had similar frequencies and numbers of B10 cells within bone marrow and peripheral lymph nodes (Fig. 6B; Table I). In contrast, the B10 cell subset was significantly expanded within the blood, spleen, mesenteric lymph nodes, and peritoneum of NZB/W F1 mice compared with C57BL/6 mice. This finding was also true for B10pro and B10 cells, in which 12–13% of blood and spleen B cells in NZB/W F1 mice had the capacity to mature and express cytoplasmic IL-10 with stimulation. Remarkably, almost half of the peritoneal cavity B cells in NZB/W F1 mice had the capacity to mature and express cytoplasmic IL-10 with stimulation. Thus, the B10pro and B10 subsets are rare in both NZB/W F1 and C57BL/6 mice, but these regulatory cells are already significantly expanded in NZB/W F1 mice at the time that B cell depletion exacerbates lupus development (Fig. 4). This study revealed both protective and pathogenic roles for B cells in murine lupus. Prophylactic depletion of mature B cells in NZB/W F1 mice by CD20 mAb prolonged survival in pristane-accelerated lupus up until ∼32 wk old (Fig. 2). By contrast, CD22 mAb depletion of the mature recirculating bone marrow, blood, and marginal zone B cell subsets resulted in only a slight improvement in survival. Therapeutic low-dose CD20 mAb treatment also successfully prolonged survival and delayed the appearance of proteinuria during spontaneous lupus in NZB/W F1 mice when administered during the onset of disease symptoms between 12 and 20 wk old (Fig. 4). In contrast, CD20 mAb-induced B cell depletion at 4 wk old significantly shortened survival time and accelerated proteinuria development. B cell depletion during late-stage disease did not affect survival or disease symptoms in NZB/W F1 mice. Therefore, mature B cell depletion by CD20 mAb resulted in strikingly different disease outcomes depending on the timing of B cell depletion, with B cell depletion during disease progression preferentially reducing the pathogenic effects of B cells on disease. Mature B cell depletion in young NZB/W F1 mice prior to disease symptoms led to accelerated mortality, nephritis, and ANA production (Fig. 4). Similarly, total B cell depletion during contact hypersensitivity induction or EAE initiation dramatically exacerbates inflammation and disease, whereas B cell depletion during EAE progression significantly inhibits disease manifestations (26, 27). Early B cell depletion exacerbates both hypersensitivity responses and EAE because of the depletion of splenic B10 cells, a recently characterized IL-10–producing regulatory B cell subset (26–28, 57). IL-10–producing B10 cells and potentially other regulatory B cell subsets also have critical suppressive roles in arthritis, colitis, and autoimmune diabetes in mice (40, 42, 58–60). B10 cells in NZB/W F1 mice were phenotypically similar, if not identical, to their IL-10 competent B cell counterparts in C57BL/6 mice (Fig. 6). However, B10 and B10pro cell frequencies and numbers were significantly expanded along with the marginal zone and B1a subsets in 8–10-wk-old NZB/W F1 mice (Figs. 1, 5, 6; Table I), a time point prior to disease onset (4–9). Importantly, CD20 mAb treatment depleted 99% of IL-10–producing B cells in both NZB/W F1 and C57BL/6 mice (Fig. 5F). IL-10–producing regulatory B cell elimination by early CD20 mAb treatment may thereby explain exacerbated lupus-like disease in young NZB/W F1 mice. Proof of this concept awaits the production of CD20-deficient NZB/W F1 mice that will allow the adoptive transfer of IL-10–producing CD1dhiCD5+ B cells from CD20−/− NZB/W F1 mice into CD20 mAb-treated NZB/W F1 mice. The generation of B cell-specific IL-10−/− NZB/W F1 mice will also determine whether exacerbated disease is due exclusively to B cell IL-10 production. Nonetheless, as currently demonstrated in the companion manuscript, the pathologic manifestations of nephritis appear significantly earlier, and survival is significantly reduced in NZB/W F1 mice that lack B10 cells because of constitutive CD19-deficiency (61). Moreover, the transfer of splenic CD1dhiCD5+ B cells from wild type NZB/W F1 mice into CD19−/− NZB/W F1 recipients significantly prolongs their survival. Thus, B10 cells in NZB/W F1 mice appear to be functionally similar to their phenotypically identical counterparts in C57BL/6 mice (Fig. 6), where they are known to regulate acute inflammation. Therefore, both early- and late-stage lupus represent a balance between regulatory B10 cells and pathogenic B cell functions in combination with regulatory and pathogenic T cells. B cell depletion during autoimmunity in NZB/W F1 mice is likely to have beneficial effects beyond reducing autoantibody production (13). Specifically, B cell depletion had protective effects in NZB/W F1 mice, but did not substantially reduce anti-histone or dsDNA autoantibody production, isotype switching to pathogenic IgG subclasses (Fig. 2, data not shown), or ANA generation (Fig. 4C). 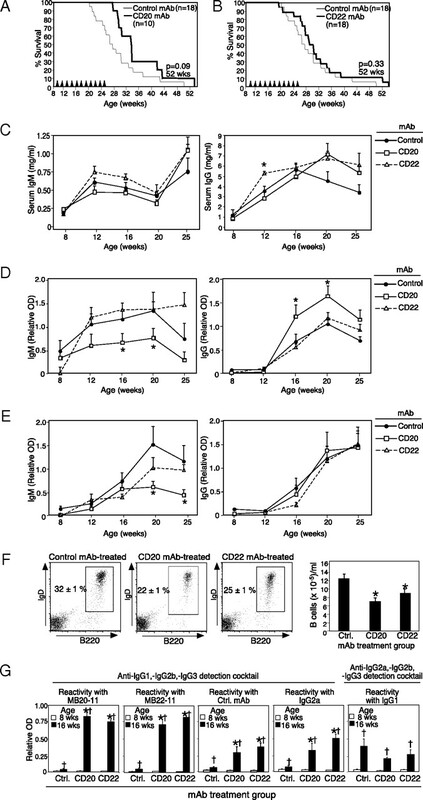 B cell depletion using the MB20-11 CD20 mAb normally blocks humoral immune responses and the serum Ig and autoantibody increases typically found in aging autoimmune mice (39, 40, 54). However, CD20 mAb-induced B cell depletion does not have significant effects on pre-existing (CD20-negative) long-lived plasma cells and produces only small reductions in serum Ig or autoantibody levels in adult mice (54). Autoantibody production and increases in total serum Ig in NZB/W F1 mice might therefore reflect the inability of even potent CD20 mAbs to deplete long-lived plasma cells that could have been generated prior to mAb treatment and/or disease onset (54). Furthermore, B1a and conventional B cells in the peritoneal cavity are depleted at slower rates, which can provide a niche in NZB/W F1 mice that is protected from ADCC (45). Importantly, successful CD20 mAb treatment in patients with SLE does not always correlate with reduced autoantibody levels (30, 33, 62–64), consistent with pathogenic B cells contributing to autoimmunity via mechanisms independent of autoantibody production. Nonetheless, CD20 mAb treatment near the onset of disease initiation successfully enhanced survival in NZB/W F1 mice in both pristane-accelerated and conventional lupus. Consistent with autoantibody and potential rheumatoid factor production by autoimmune NZB/W F1 mice (55, 56), serum IgG Abs reactive with IgG2a, IgG2c, and IgG1 were present in control, CD20, and CD22 mAb-treated NZB/W F1 mice at 16 wk old. Autoimmune patients treated with rituximab (anti-human CD20) or other mAb therapies frequently produce anti-therapeutic mAb Ab responses, and this is often correlated with decreased treatment efficacy (65–67). Anti-IgG Ab production was likely to also contribute to the reduced effectiveness of B cell depletion in older NZB/W F1 mice (Figs. 2F, 4), particularly in mice given CD20 or CD22 mAbs multiple times. It is possible that CD20 or CD22 mAbs bound to the surface of B cells form immune complexes that enhance the production of anti-mAb treatment Abs. It is possible that the therapeutic CD20 and CD22 mAbs or their idiotypes are recognized as foreign proteins, because the NZB and NZW mouse strains express IgG2a e and n haplotypes, respectively, whereas the MB20-11 and BALB/c-derived IgG2a isotype control mAbs are IgG2c (also known as IgG2ab) and IgG2a (a haplotype), respectively. Thus, it will be necessary to repeat and validate the current results in this study using properly isotype-matched IgG2a e or n haplotype mAbs to determine whether the current control and treatment mAbs had any effects beyond B cell depletion that might have ultimately contributed to the development of resistance to therapy in mice that received multiple mAb doses. 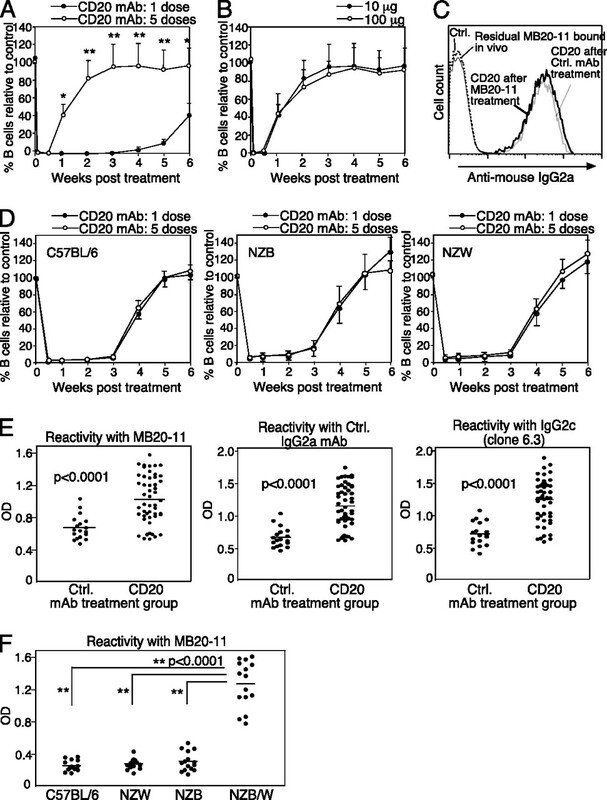 However, it is interesting that in contrast to NZB/W F1 mice, parental NZB, NZW, and C57BL/6 mice did not develop measurable resistance to CD20 (MB20-11) mAb depletion or generate anti-CD20 Ab responses after repeated treatments (Fig. 3). Anti-therapeutic Ab production and their consequential negative effects on B cell depletion were therefore unique to NZB/W F1 mice. Undoubtedly, the production of anti-therapy Ab and increased Ig and autoantibody production in NZB/W F1 mice following B cell depletion reflects the effects of their potent autoimmune susceptibility genes, which can contribute to the inability of total B cell depletion to provide effective long-term disease treatment. B cells are inherently resistant to B cell depletion in autoimmune mice expressing a human CD20 transgene (34), and this has provided a potential explanation for the small therapeutic benefit from rituximab in recent clinical trials for lupus nephritis and SLE (29–33). However, CD20 and CD22 mAbs efficiently depleted blood and tissue B cells or B cell subsets, respectively, equally in both NZB/W F1 and C57BL/6 mice (Fig. 1). One 10- or 100-μg dose of CD20 mAb (MB20-11) cleared ≥84% of spleen B cells in NZB/W F1 and C57BL/6 mice, and low doses of CD20 mAb in NZB/W F1 mice significantly improved survival and delayed proteinuria. These results contrast with those of Ahuja et al. (34), in which B cells from autoimmune strains, including NZB/W F1 and MRL/lpr mice, were found to be inherently refractive to high dose (3 mg/wk) CD20 (18B12, IgG1) mAb-induced depletion compared with nonautoimmune-prone BALB/c mice in which ∼65% of spleen B cells were depleted. The reason for the striking discrepancies in B cell clearance between studies may be due in part to the particular CD20 mAbs or mAb isotypes used, because individual CD20 mAbs do not elicit comparable B cell depletion, and IgG2c CD20 mAbs are superior to IgG1 mAbs in eliciting B cell depletion by ADCC in vivo (37, 47, 68). Although B cell depletion using 10–100 μg MB20-11 CD20 mAb did not significantly decrease total ANA, IgG autoantibody levels, or serum IgG in the current study (Figs. 2, 4), Ahuja et al. (34) demonstrated that treatment of human CD20 transgenic-MRL/lpr mice with high doses of anti-human CD20 mAb (10 mg/wk given twice weekly for 7–10 wk) reduced disease manifestations including proteinuria, nephritis, and ANA levels, although survival was not assessed. It is unknown whether these high doses of exogenous IgG or B cell depletion ameliorated disease symptoms, because disease in mice treated with control IgG was not reported. Alternatively, differences in CD20 mAb-mediated alterations in serum Ig, autoantibody, and ANA levels between our study and study by the Ahuja et al. (34) may be related to differences in disease between NZB/W F1 mice versus human CD20Tg-MRL/lpr mice. B cells from NZB/W F1 mice were efficiently depleted at the onset of CD20 and CD22 mAb treatment, with total B cell depletion effectively improving survival without eliminating IgG autoantibodies in NZB/W F1 mice. Therefore, B cells in NZB/W F1 mice may contribute significantly to autoimmunity through their significant role during CD4+ T cell activation in response to autoantigens and low-dose Ag challenge (16). B cell-depleting therapies, such as CD20 and CD22 mAbs, may also elicit effects that extend beyond depleting B cells. Although premature B cell depletion in NZB/W F1 mice had deleterious effects, the results of this study suggest that mature B cell depletion can be an effective treatment for patients with SLE, when initiated shortly after disease onset. Although rituximab has variable effects on autoantibody levels in patients with SLE, treatment can improve the clinical manifestations of SLE for some patients in the absence of significant changes in serum anti-dsDNA Ab levels (30, 33, 62–64). This finding suggests that pathogenic B cells have non–Ab-producing effector functions in human SLE that are also observed in murine lupus. The development of resistance to B cell-depletion therapy can also be a major contributing factor to decreased drug efficacy in patients with SLE, as the degree of blood B cell depletion associates with the extent of clinical improvement, while peripheral blood B cell reconstitution precedes relapse in the majority of patients (30, 63). These findings suggest the combined use of immunosuppressive therapies to inhibit anti-IgG Ab development that can antagonize B cell depletion during CD20 mAb treatment and inhibit T cell activation in human autoimmune disease. Because the effects of rituximab and other B cell-depleting therapies on human regulatory B10 cells are unknown, caution should be used when administering B cell-depletion therapies, because regulatory B10 cell depletion may potentially initiate and/or accelerate the development of autoimmunity in some cases. We thank Jacquelyn Bryant for help with the statistical analysis of these results. Disclosures T.F.T. is a shareholder and paid consultant for Angelica Therapeutics, Inc. and is a consultant for MedImmune. K.M.H was a paid consultant for Angelica Therapeutics. This work was supported by grants from the National Institutes of Health (CA96547, CA105001, and AI56363) and a Grant-in-Aid from the Ministry of Education, Science, and Culture of Japan. K.M.H. was supported in part by a Career Development Fellowship Award from the Leukemia and Lymphoma Society. 2001. Systemic lupus erythematosus: an autoimmune disease of B cell hyperactivity. Nat. Immunol. 2: 764–766.
. 2003. Abnormal germinal center reactions in systemic lupus erythematosus demonstrated by blockade of CD154-CD40 interactions. J. Clin. Invest. 112: 1506–1520.
. 2006. Animal models of systemic lupus erythematosus. In Dubois' lupus erythematosus, 7th Ed, Wallace D. J., B. Hahn, E. L. Dubois, eds. Lippincott Williams & Wilkins, Philadelphia, PA, p. 299–355.
. 2000. Activated B cells express increased levels of costimulatory molecules in young autoimmune NZB and (NZB x NZW)F(1) mice. Clin. Immunol. 94: 51–63.
. 2002. Expansion of marginal zone B cells is not sufficient for the development of renal disease in NZBxNZW F1 mice. Lupus 11: 277–286.
. 2004. Separation of the New Zealand Black genetic contribution to lupus from New Zealand Black determined expansions of marginal zone B and B1a cells. J. Immunol. 172: 4159–4166.
. 1983. The “Ly-1 B” cell subpopulation in normal immunodefective, and autoimmune mice. J. Exp. Med. 157: 202–218.
. 1987. Proliferation of Ly-1 B cells in autoimmune NZB and (NZB x NZW)F1 mice. Eur. J. Immunol. 17: 809–814.
. 2004. Mechanisms of peritoneal B-1a cells accumulation induced by murine lupus susceptibility locus Sle2. J. Immunol. 173: 6050–6058.
. 1978. Increased spontaneous polyclonal activation of B lymphocytes in mice with spontaneous autoimmune disease. J. Immunol. 121: 2213–2219.
. 1999. Control of separate pathogenic autoantibody responses marks MHC gene contributions to murine lupus. Proc. Natl. Acad. Sci. USA 96: 8098–8103.
. 1999. The central and multiple roles of B cells in lupus pathogenesis. Immunol. Rev. 169: 107–121.
. 2008. B-lymphocyte contributions to human autoimmune disease. Immunol. Rev. 223: 284–299.
. 1998. A new role for B cells in systemic autoimmunity: B cells promote spontaneous T cell activation in MRL-lpr/lpr mice. J. Immunol. 160: 51–59.
. 2005. Antigen-specific B cells are required as APCs and autoantibody-producing cells for induction of severe autoimmune arthritis. J. Immunol. 174: 3781–3788.
. 2007. Therapeutic B cell depletion impairs adaptive and autoreactive CD4+ T cell activation in mice. Proc. Natl. Acad. Sci. USA 104: 20878–20883.
. 1993. B lymphocytes in vivo fail to prime naive T cells but can stimulate antigen-experienced T lymphocytes. J. Exp. Med. 177: 679–690.
. 1999. A novel mouse with B cells but lacking serum antibody reveals an antibody-independent role for B cells in murine lupus. J. Exp. Med. 189: 1639–1648.
. 1994. The role of B cells in lpr/lpr-induced autoimmunity. J. Exp. Med. 180: 1295–1306.
. 2004. B cell-dependent TCR diversification. J. Immunol. 172: 4709–4716.
. 2007. Fitness of cell-mediated immunity independent of repertoire diversity. J. Immunol. 178: 2950–2960.
. 2000. B lymphocytes regulate dendritic cell (DC) function in vivo: increased interleukin 12 production by DCs from B cell-deficient mice results in T helper cell type 1 deviation. J. Exp. Med. 192: 475–482.
. 2001. Splenic T zone development is B cell dependent. J. Exp. Med. 194: 1649–1660.
. 1999. Organogenic role of B lymphocytes in mucosal immunity. Science 286: 1965–1968.
. 1999. Influence of lymphocytes on the presence and organization of dendritic cell subsets in the spleen. J. Immunol. 163: 4894–4900.
. 2008. Regulatory B cells inhibit EAE initiation in mice while other B cells promote disease progression. J. Clin. Invest. 118: 3420–3430.
. 2004. Rituximab improves peripheral B cell abnormalities in human systemic lupus erythematosus. Arthritis Rheum. 50: 3580–3590.
. 2004. B cell depletion as a novel treatment for systemic lupus erythematosus: a phase I/II dose-escalation trial of rituximab. Arthritis Rheum. 50: 2580–2589.
. 2005. Tolerance and short term efficacy of rituximab in 43 patients with systemic autoimmune diseases. Ann. Rheum. Dis. 64: 913–920.
. 2008. B-cell-targeted therapy for systemic lupus erythematosus: an update. BioDrugs 22: 239–249.
. 2009. Update on immunotherapy for systemic lupus erythematosus—what’s hot and what’s not! Rheumatology (Oxford) 48: 332–341.
. 2007. Depletion of B cells in murine lupus: efficacy and resistance. J. Immunol. 179: 3351–3361.
. 2006. New prospects for autoimmune disease therapy: B cells on deathwatch. Arthritis Rheum. 54: 1–9.
. 2006. CD22 ligand binding regulates normal and malignant B lymphocyte survival in vivo. J. Immunol. 177: 3063–3073.
. 2004. The innate mononuclear phagocyte network depletes B lymphocytes through Fc receptor-dependent mechanisms during anti-CD20 antibody immunotherapy. J. Exp. Med. 199: 1659–1669.
. 2004. Mouse CD20 expression and function. Int. Immunol. 16: 119–129.
. 2006. B-lymphocyte depletion reduces skin fibrosis and autoimmunity in the tight-skin mouse model for systemic sclerosis. Am. J. Pathol. 169: 954–966.
. 2007. B cell depletion delays collagen-induced arthritis in mice: arthritis induction requires synergy between humoral and cell-mediated immunity. J. Immunol. 179: 1369–1380.
. 2007. Treatment with CD20-specific antibody prevents and reverses autoimmune diabetes in mice. J. Clin. Invest. 117: 3857–3867.
. 2008. B lymphocyte depletion by CD20 monoclonal antibody prevents diabetes in nonobese diabetic mice despite isotype-specific differences in Fc γ R effector functions. J. Immunol. 180: 2863–2875.
. 2008. B cell depletion inhibits spontaneous autoimmune thyroiditis in NOD.H-2h4 mice. J. Immunol. 180: 7706–7713.
. 2008. Suppression of proteoglycan-induced arthritis by anti-CD20 B Cell depletion therapy is mediated by reduction in autoantibodies and CD4+ T cell reactivity. J. Immunol. 180: 4994–5003.
. 2005. The peritoneal cavity provides a protective niche for B1 and conventional B lymphocytes during anti-CD20 immunotherapy in mice. J. Immunol. 174: 4389–4399.
. 2004. CD22 regulates B lymphocyte function in vivo through both ligand-dependent and ligand-independent mechanisms. Nat. Immunol. 5: 1078–1087.
. 2006. Antibody isotype-specific engagement of Fcgamma receptors regulates B lymphocyte depletion during CD20 immunotherapy. J. Exp. Med. 203: 743–753.
. 1998. The need for IgG2c specific antiserum when isotyping antibodies from C57BL/6 and NOD mice. J. Immunol. Methods 212: 187–192.
. 1981. Multiple differences between the nucleic acid sequences of the IgG2aa and IgG2ab alleles of the mouse. Proc. Natl. Acad. Sci. USA 78: 4495–4499.
. 2002. Effect of an exogenous trigger on the pathogenesis of lupus in (NZB x NZW)F1 mice. Arthritis Rheum. 46: 2235–2244.
. 1983. Isotypic and allotypic specificity of mouse rheumatoid factors. J. Exp. Med. 157: 1006–1019.
. 1991. Composition of immune deposits present in glomeruli of NZB/W F1 mice. Clin. Immunol. Immunopathol. 61: 296–308.
. 2010. B10 cells and regulatory B cells balance immune responses during inflammation, autoimmunity, and cancer. Ann. N. Y. Acad. Sci. 1183: 38–57.
. 2010. Regulatory B cells (B10 cells) have a suppressive role in murine lupus: CD19 and B10 cell deficiency exacerbates systemic autoimmunity. J. Immunol. 184: 4801–4809.
. 2005. B-cell depletion in the treatment of patients with systemic lupus erythematosus: a longitudinal analysis of 24 patients. Rheumatology (Oxford) 44: 1542–1545.
. 2006. Long-term comparison of rituximab treatment for refractory systemic lupus erythematosus and vasculitis: Remission, relapse, and re-treatment. Arthritis Rheum. 54: 2970–2982.
. 2006. B cell depletion therapy in systemic lupus erythematosus: effect on autoantibody and antimicrobial antibody profiles. Arthritis Rheum. 54: 3612–3622.
. 2009. Immunogenicity of anti-TNF-α agents in autoimmune aiseases. Clin. Rev. Allergy Immunol. doi:10.1007/s12016-009-8140-3.
. 2010. Clinical response, pharmacokinetics, development of human anti-chimaeric antibodies, and synovial tissue response to rituximab treatment in patients with rheumatoid arthritis. Ann. Rheum. Dis. 69: 409–412.
. 2009. Immunogenicity of rituximab in patients with severe pemphigus. Clin. Immunol. 132: 334–341.
. 2008. Type II (tositumomab) anti-CD20 monoclonal antibody out performs type I (rituximab-like) reagents in B-cell depletion regardless of complement activation. Blood 112: 4170–4177.